Patio Watcher 3-foot firewood log rack is perfect for your home's fireplace or your outdoor fire pit, also great to fit back porch, back yard deck, backyard fire pits, under eaves, tool shed or wood stove. It's your best choice while enjoy a cosy evening chatting by the fireplace or BBQ in the yard with friends. 1. Dimensions: Assembled Size 44"L X 13"W X 30"H, it will be able to holds and stores a lot of firewood. 2. Constructed of heavy duty durable steel material and double black finish power-coated for durability and long life. 3. The tube wall is 1.2mm thick and the diameter of steel pipe is 30mm, it is more sturdy and durable than normal log rack. 4. Resist rust, chipping and corrosion effectively, especially under woodpile cover after exposure to sun, rain and snow. 5. Comes in parts, includes all hardware for easy assembly. Sturdy but not too heavy, so it's easy to move. 6. Includes a removable kindling holder that is also adjustable so you can move the two pieces to match the size of your kindling. 7. Integrated hooks on the stand create places to hang the toolsets included tong, poker, broom and shovel, to maintain the fire safely and easily. 8. Effectively keep your firewood neat and organized, stable and safe, protect your firewood from rot, dampness, insects by up out of the wet ground. 9. It's one of the most popular fireplace accessories. Simple stylish design that still looks elegant and functional. Dimension: The firewood log rack frame measures 44-inch length by 13-inch width by 30-inch height, it will be able to holds and stores a lot of firewood. The 4-inch raised base above ground allows wind flow to keep dry. 25lb weight promises excellent stability. 2.Material: Firewood rack is constructed of heavy duty durable steel material and double black finish power-coated. The tube wall is 1.2mm thick and the diameter of steel pipe is 30mm, so that it is more sturdy than normal log rack. Resist rust, chipping and corrosion effectively, especially under woodpile cover and regular oil after exposure to sun, rain and snow. 3.Easy Assembly: Comes in parts and includes all hardware. Easy to put together in 10 minutes. Includes a removable kindling holder that is also adjustable so you can move the two pieces to match the size of your kindling. Integrated hooks on the stand create places to hang the tool sets included tong, poker, broom and shovel for your convenience. Function: This firewood holder is ideal for storing, drying or displaying firewood. Effectively keep your firewood neat and organized, stable and safe, protect your firewood from rot, dampness, insects by up out of the wet ground and it looks great too. 5.Stylish and functional design together with fine craftsmanship bring timeless grace. 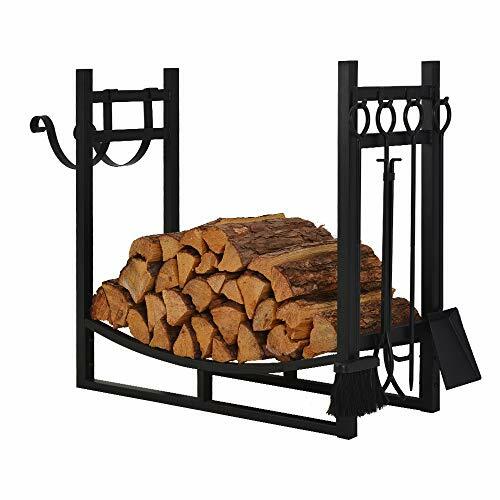 Patio Watcher firewood log rack is perfect for your home's fireplace or your outdoor fire pit, also great to fit back porch, back yard deck, backyard fire pits, under eaves, tool shed or wood stove. It's your best choice while enjoy a cosy evening chatting by the fireplace or BBQ in the yard with with your family and friends. If you have any questions about this product by Patio Watcher, contact us by completing and submitting the form below. If you are looking for a specif part number, please include it with your message.